CCTA involves injecting iodinated contrast into an arm in the vein; the imaging is timed to the appearance of the contrast into your heart and the entire scanning, gated to your heart beat, takes generally about 10 seconds. There is more radiation exposure than with a conventional Heart Scan but PLC has been practicing radiation limitation imaging since we started doing Cardiac CT in the early 2000’s. Often the radiation dose is comparable to a diagnostic mammogram. CCTA is timed to your heart beat and allows us to not only assess native heart or coronary arteries but also define heart size/ function and evaluate heart valves. In clients with known heart disease, CCTA also can be used to visualize coronary artery stents as well a coronary artery bypass grafts. CCTA is the ONLY clinically available imaging modality that can display the heart in three-dimensions, without distortion, in an infinite number of views. A unique advantage of virtual coronary angiography using CCTA is that we can identify the physical characteristics of the coronary artery plaque; not just measure ‘stenosis’ or the degree of coronary narrowing. What we mean by plaque is the development and accumulation of white blood cells, inflammatory proteins, and byproducts of inflammation that appears in the WALL of the blood vessel years before it can develop into a heart attack or a true blockage of blood flow. There is a very significant ‘silent’ period as the plaque develops in the wall, accumulating and expanding, actually making the wall bulge but not narrowing the vessel ‘lumen’ [i.e. the tube part of the artery through which blood flows]. Below is an artist’s rendering of the process of atherosclerotic plaque development over YEARS! What Unique Features of Plaque is Found Using CCTA?The problem is that the development of plaque produces no symptoms until it may be too late. The first and last event in 50% of the people who develop a heart attack is death or major disability. Thus, finding the plaque earlier is vitally important as, if found early, we can then do effective means of intervention from diet/exercise, to medications, or even ‘interventions’ that would extent longevity and overall health. However, it is the anatomic features that the atherosclerotic plaque assumes which can provide vital information. As noted in the figure above, plaque ‘instability’ can result in rupturing the plaque through the blood vessel wall [sort of like a volcano exploding] and exposing the flowing blood to this debris. The debris is highly ‘thrombogenic’ meaning that it is likely, when mixed with the blood, to develop a local blood clot or ‘thrombus’. One of the reasons we often suggest aspirin therapy is that this can act as a mild ‘anticoagulant’ and allow the repairs to the ruptured wall segment to clot off WITHOUT ALSO clotting off the entire vessel lumen [resulting then in STOPPING a heart attack]. CCTA is unique for non-invasive imaging technologies in that it can be used to discern the characteristics of the atherosclerotic plaque. 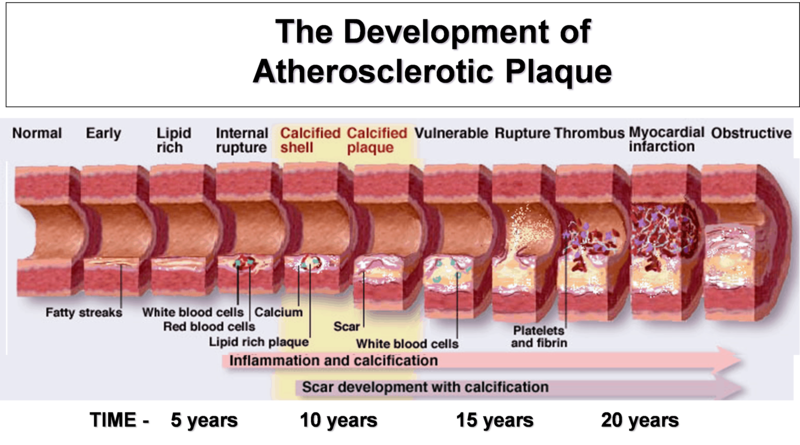 I always say that ‘…calcification of the atherosclerotic plaque is a GOOD thing, but for a BAD reason.’ What I mean is that the calcification or ‘hardening of the arteries’ [to use an old fashion but well known description] is an attempt by the body to contain the areas of blood cells and other debris in a ‘calcified shell’ [see figure to left]. In this way, over time, it can help ‘stabilize’ the plaque. Although the presence and amount [i.e. 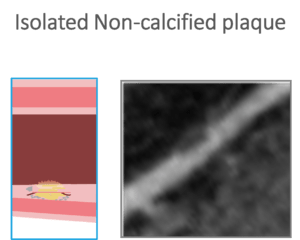 the coronary artery calcium ‘score’] is a useful surrogate to the overall atherosclerotic plaque burden] the calcified plaque, for the most part is stable, although marking the progress of the healing. Calcified plaque in general is confined to the vessel wall and can be seen in situations in which there has NOT been a rupture of the plaque through the single cell layer [called the endothelium] into the vessel lumen. For an example from CCTA consider the figure below. 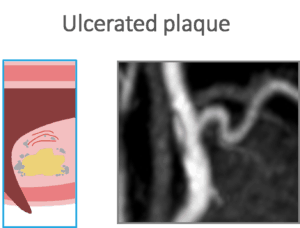 This is then considered ‘stable’ plaque.Note in particular, the adjacent cartoon indicates that the vessel wall, which contains the calcified plaque, has compensated for the space occupied by calcification by thickening, but there is no compromise to the vessel lumen diameter itself. 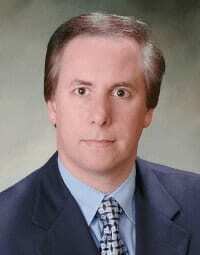 Non-calcified plaque is another matter. This plaque is in transition and in many instances it has already eroded through the endothelium and is creating an isolated area of blood clot or thrombus in the vessel lumen. This type of plaque cannot be identified on the standard ‘Heart Scan’ but is readily defined by CCTA. This plaque is considered by most experts to be ‘potentially unstable’ – that is, it can possibly go on to form more local blood clots and increase the risk of a heart attack. When identified by CCTA we insist that the patient take aggressive actions to stabilize the plaque by starting an aspirin regiment and taking cholesterol medications [in particular ‘statins’ that actually can help stabilize the plaque]. Any other sources for generalized inflammation are also addressed. The goal here is to allow the non-calcified plaque to be ultimately covered by the endothelium thus sealing the rupture and to allow the time for the body to calcify the plaque. An example of isolated non-calcified plaque is shown in the figure below. Note, in this instance there is very mild encroachment of the non-calcified plaque into the vessel lumen, but no current compromise to arterial blood flow. The adjacent cartoon shows that the endothelium barrier has been broached and there is now an isolated area of blood clot or thrombosis protruding into the vessel lumen. 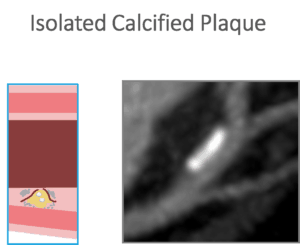 ‘Mixed’ plaque quite simply means the presence of BOTH isolated calcified and non-calcified plaque in adjacent areas of the blood vessel. 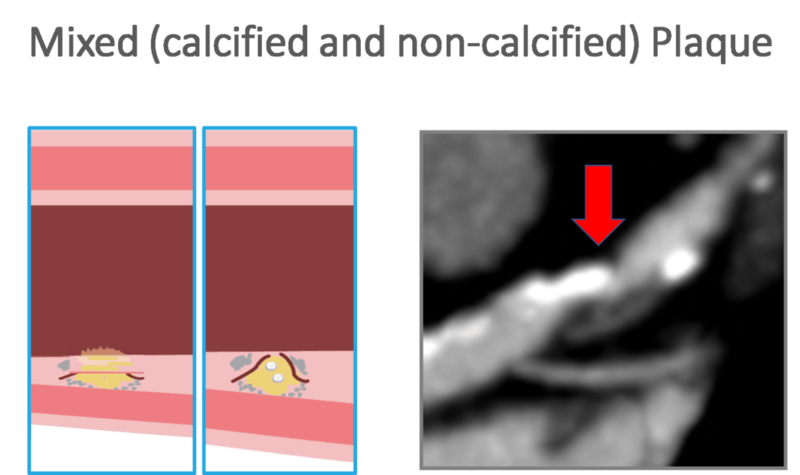 It is usually observed at the same time that the coronary artery calcium score is in the ‘moderate’ or ‘extensive’ range, again showing the power of the non-contrast CAC score as the more ‘hard/stable’ plaque, the more likely there is also to be ‘non-calcified/potentially unstable/transitioning’ plaque. The presence of mixed plaque further encourages very aggressive interventions with respect to modifiable risk factors. Also in such individuals there is an increased likelihood of actual ‘obstructive’ disease that may require conventional/diagnostic/invasive coronary angiography and possibly mechanical interventions such as angioplasty/placement of stents/open-heart bypass surgery. Above is an example of a CCTA showing ‘mixed plaque’. Note at the arrow there is an area of what appears to be ‘significantly narrowed lumen diameter’ suggesting a potentially important narrowing that may require further investigation. The presence of plaque ‘ulceration’ is exceeding uncommon in an otherwise stable patient; but regardless of the clinical situation, is an important and ominous observation. To get a general idea of what ulceration means – think of something like a sudden pothole appearing on the road – the support structure of the road has totally disrupted – a sinkhole is another physical example. The ulceration can also be part of a ‘dissection’ or tearing apart or weakening so much that splitting the vessel apart may be eminent. Say you are driving down the road and one of your tires begins to shred – the layers that make up the tire wall are spitting or separating from each other. Most of you are familiar with the term ‘aortic dissection’ – such as happened with TV star John Ritter and Actor Alan Thicke. Also, many of you may know the term ‘aneurysm’ referring to a bulge in the wall of a large artery [such as the aorta] that with time, as it enlarges and bulges more will burst suddenly and without warning. Shown below is an example of dissected/ulcerated plaque occurring in a coronary artery as diagnosed using CCTA. The Princeton Longevity Center has a long history of performing and teaching CCTA. A CCTA can be done as an optional component to your Comprehensive Medical Examination. The above has been an attempt to provide an overview of a single facet of what can be done in terms of diagnostic testing at PLC. For more information check out Twitter [@thePLC, or @DrRumberger], take a look at other blogs on our website, check out my YouTube Channel for case presentation, or if you are a physician consider subscribing to my Cardiac CT Workshop, featuring 50 case histories and diagnoses using Cardiac CT.